Opis: The Miscellaneous Works of the Late Richard Penn Smith (Classic Reprint) - Smith Horace W.
Excerpt from The Miscellaneous Works of the Late Richard Penn Smith<br><br>In publishing the following pages I have given them to the printer in the exact condition in which the author left them - I have not altered nor added a line, except by way of note. And not wishing to publish any thing which the reader might think was flattery, I have taken the liberty of using a biographical sketch - written some years ago by my father&apos;s friend, Morton McMichael, Esq. : -<br><br>Richard Penn Smith was born at the south-east corner of Fifth and Chesnut, on the 13th day of March, 1779; he received his early education at Mount Airy, and at Joseph Neef&apos;s Grammar School, at the Falls of Schuylkill. He entered the law office of the late William Rawle, Esq., and upon arriving at age was admitted as a member of the Bar.<br><br>About the Publisher<br><br>Forgotten Books publishes hundreds of thousands of rare and classic books. Find more at www.forgottenbooks.com<br><br>This book is a reproduction of an important historical work. Forgotten Books uses state-of-the-art technology to digitally reconstruct the work, preserving the original format whilst repairing imperfections present in the aged copy. In rare cases, an imperfection in the original, such as a blemish or missing page, may be replicated in our edition. We do, however, repair the vast majority of imperfections successfully; any imperfections that remain are intentionally left to preserve the state of such historical works. 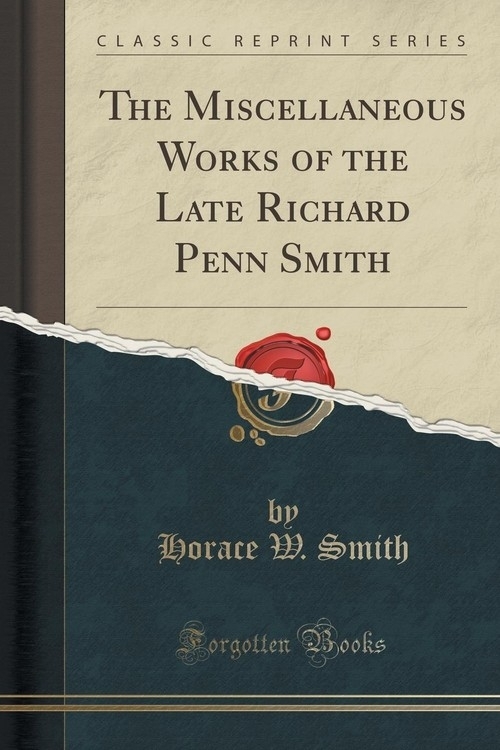 Szczegóły: The Miscellaneous Works of the Late Richard Penn Smith (Classic Reprint) - Smith Horace W.
Recenzje: The Miscellaneous Works of the Late Richard Penn Smith (Classic Reprint) - Smith Horace W.